Would be exciting if Bradley Beal can be a Thunder. I really hope this team can get back to the NBA Finals soon. This line-up is a killer, even without Beal. they do not have the cap space for BBeal thats if they want to keep EKanter. he is worth 7.5M. he is worth it especially how he performed this season. how will CoachBDonovan change the style of play of this KD/RW 1-2 punch team? and, how will they make use of the protected 18th draft pick? Malabo. to. Re-sign Kanter first. Sana magkahimala mamaya sa draft lottery. the previous rookies of OKC are good players, notably, JLamb. just look at his summer league stats. he just has a problem blending with the KD/RW playbook. they as in KD and RW. can someone answer the reason why KMartin and RJackson were begging to be traded? let hope the new coach can fix this problem. I hope KD goes to an East team. RW really wants to take this team over. 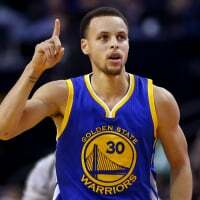 Golden State Warriors is the new NBA champion. Hopefully, this team will be more motivated and inspired to do great this upcoming season. Quota na injuries natin last season,sana tama na ngayon! And hopefully,KD can reverse the Lil B curse. sayang si Lamb. Di masyado nagamit at nadevelop. Grabe. This is just plain greed. OKC was supposed to be SA Jr but this is where we can see how important it is to have selfless players like Duncan. as great as Kanter is, he is overestimating himself. Thunder should not fully invest. May makukuha p nmang ibang maayos na player for less cost. if OKC will not match the POR offer to EKanter, ang obob din pa la ng bagong coach. they have a history of throwing away quality players just to keep KD and RW happy hogging the ball. Gosh, OKC did match Kanter's offer. okc is in tricky situation right now. they already found a consistent 3rd low-post scorer. but they will overpay. also, kanter is really poor on defense. on the other hand, the cap will spike so they could take the risk. Plus if they let go of Kanter they can't sign anyone else,they're over the cap.Si Kanter lang ang pwede nila i-sign with that kind of money. they need to unload some overpaid scrubs like PJonesIII. disagree ..... EKanter has proven that he could score with MVP numbers. he is now a +20/10 double double player and he was able to show that he could play and contribute with RWestbrook. what is strange is they re-sign KSingler who hasnt proven anything with a midlevel contract which is higher than most of the OKC veterans.